Your House Is Mine street poster exhibition wheatpasted on Bullet Space exterior, 1990. Posters by David Wojnarowicz, John Fekner, Lee Quiñones, and others address homelessness, AIDS, addiction, and other perils that threatened Lower East Siders. 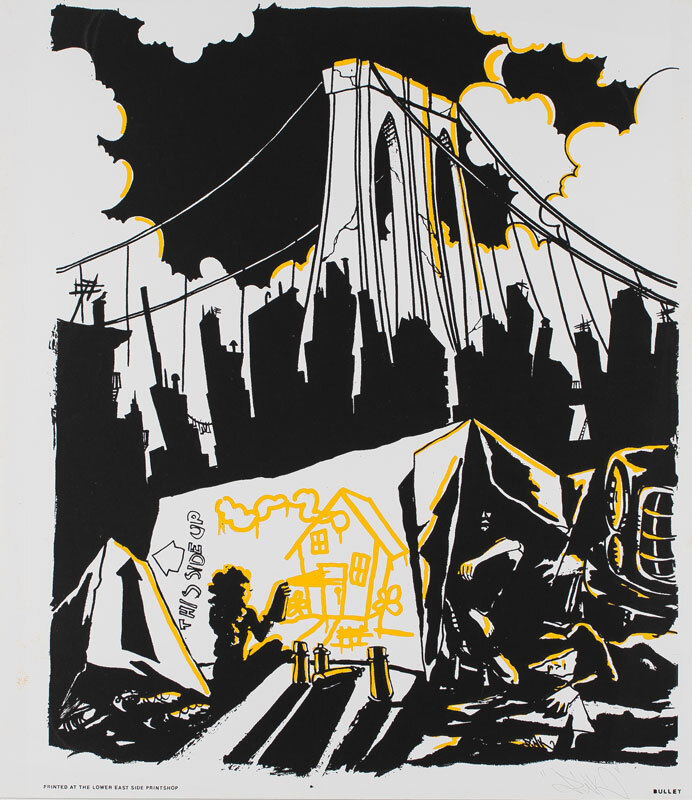 Lady Pink’s silkscreen print “Under the Brooklyn Bridge,” from Your House Is Mine, depicts a young girl painting her vision of a “dream house” on a cardboard box in a homeless encampment. Few visual works capture the spirit of the East Village and the Lower East Side in the 1980s like Your House Is Mine, a street poster project begun in 1988 and compiled into an oversize artists’ book in 1992. Thirty-three silkscreen prints, by David Wojnarowicz, Lady Pink, Lee Quiñones, John Fekner, Martin Wong, Juan Sánchez, Anton van Dalen, Nadia Coen, and others, wage what Elizabeth Hess called “an ongoing class war against landlords, drugs, and AIDS and an eloquent protest against the lack of a safe environment for children” (Artforum, October 1991). At the heart of the project are printmaker Andrew Castrucci and the art squat Bullet Space, the subjects of a new online exhibition at Gallery 98. 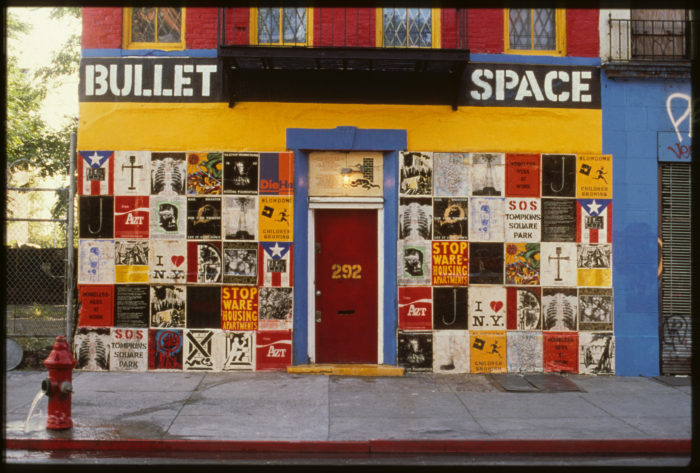 Located amid Alphabet City’s abandoned buildings and rubble-strewn lots, Bullet Space was a key battleground in the East Village squatters’ struggle of the 1980s and ’90s. 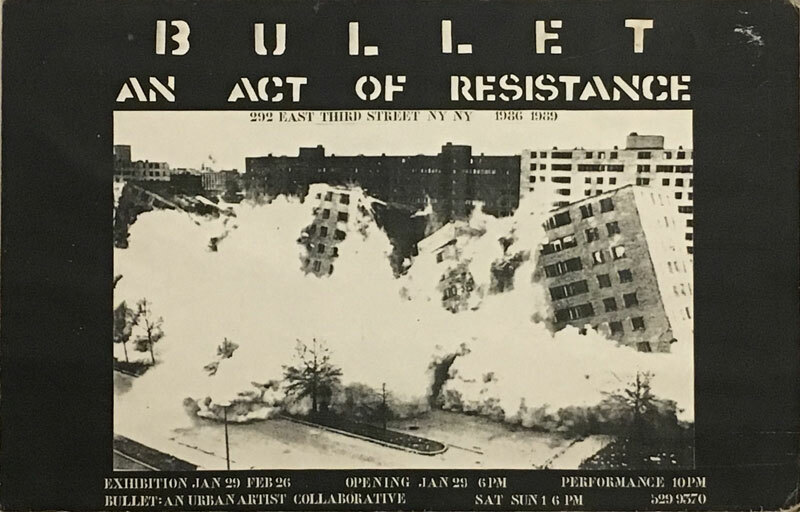 In addition to the housing it provided for artists, Bullet maintained an art space to foster the local traditions of radical street art and propaganda, and a print shop where Castrucci lent his expertise to collaborations with other artists. Its most ambitious product, Your House Is Mine, first appeared as a guerrilla public art piece; as a limited-edition book, it has since been acquired by leading museums and libraries in the U.S. and Europe. Gallery 98’s online exhibition allows collectors to purchase for the first time rare artists’ proofs from Your House Is Mine—previously available only as a bound volume. The exhibition also includes a selection of Bullet Space posters and flyers (tracking the gentrification battles), and exhibition posters (including caricatures of Ronald Reagan and Donald Trump) from A&P Gallery, which Andrew Castrucci operated with his architect brother, Paul, from 1984 to 1986. Rare copies of the complete Your House Is Mine book are also available.